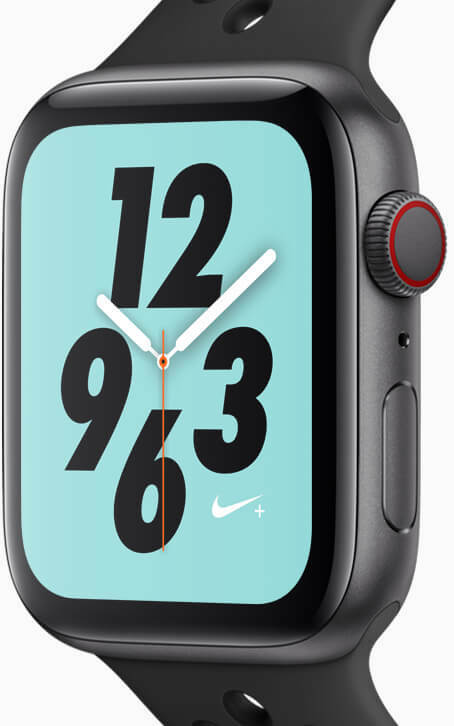 Get the new Apple Watch Series 4 (GPS + 4G). Stream, text, call, with just your watch on the UK’s no.1 network. Available to EE customers with an iPhone on an EE SIM only or pay monthly plan. 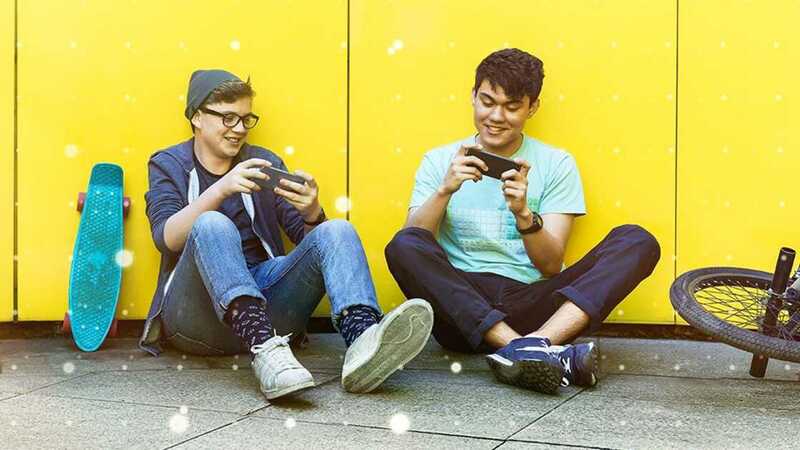 You’ll need an iPhone SE, an iPhone 6 or above running iOS 12 or later software on our EE network with either a SIM only or a pay monthly plan. 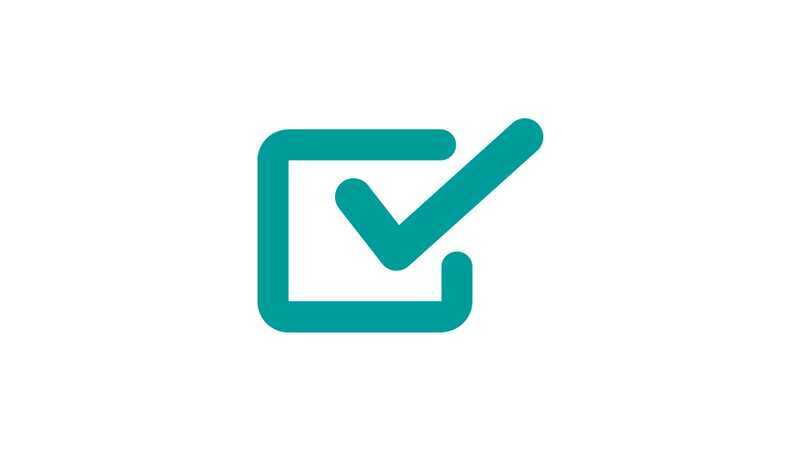 The Apple Watch needs to be added to the same EE account as the iPhone you want to use it with, so please make sure you are the lead name on that account. You’ll get unlimited data on your Apple Watch Series 4 (GPS + 4G) and you're good to go! Share your minutes and text allowances from your phone and enjoy unlimited data. 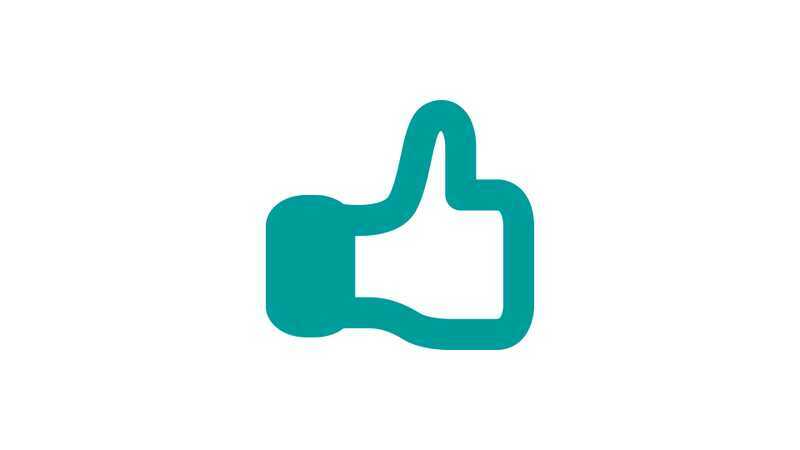 You’ll also benefit from all of the extras that come with being an EE customer, including free Apple Music for six months, WiFi calling and UK and Ireland call centres. Can I buy Apple Watch Series 4 from other retailers? 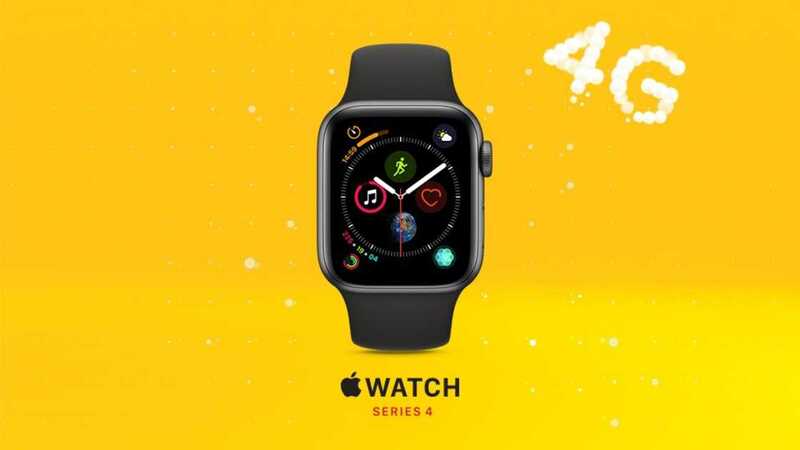 You can also buy an Apple Watch Series 4 (GPS + 4G) from other retailers including Apple, Argos, John Lewis and Currys. If you’ve bought from another retailer and want to buy an EE data plan, first you’ll need to pair your Apple Watch Series 4 (GPS + 4G) with the EE network on your iPhone. Once you've paired your watch to your iPhone, you can add a 30-day plan, which you can buy through the Apple Watch app on your iPhone. What size can I get the Apple Watch in? Apple Watch Series 4 is available in 40mm and 44mm sizes (vertical height). Apple Watch Series 3 is available in 38mm and 42mm. What iPhone models are compatible with the Apple Watch? 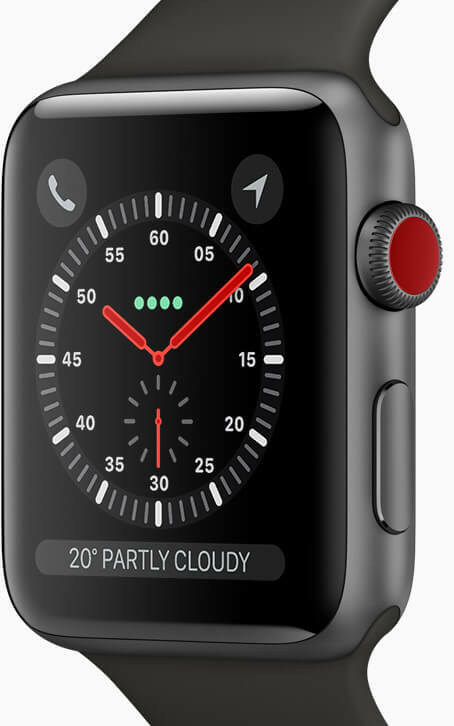 For Apple Watch Series 4 (GPS + Cellular), you’ll need an iPhone 6 or later model, running iOS 12 or later. For Apple Watch Series 3 (GPS + Cellular), you’ll need an iPhone 6 or later, running at least iOS 11. For Apple Watch Series 3 (GPS), you’ll need an iPhone 5s or later model, running at least iOS11. Will the Apple Watch work on EE's network? 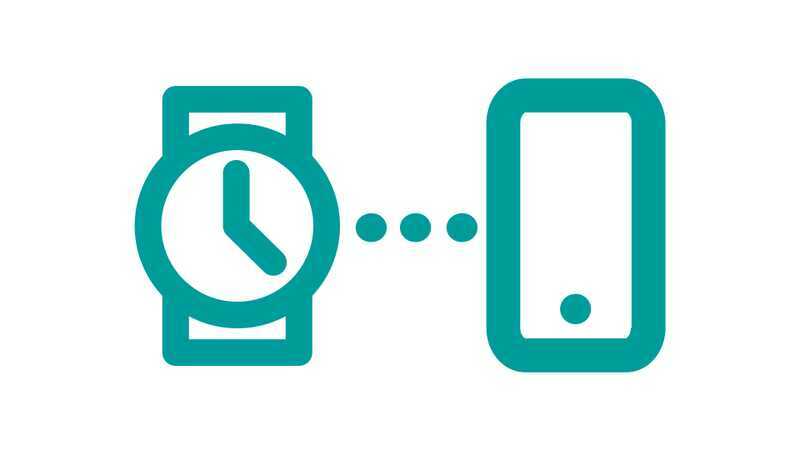 Yes, you’ll be able to call, stream, and text with just your watch on the UK’s no.1 network, provided you have a compatible iPhone on either a SIM only or pay monthly plan with EE. The Apple Watch needs to be added to the same EE account as the iPhone you want to use it with, so please make sure you are the lead name on that account. Once linked to your account, you’ll get unlimited data on your Apple Watch Series 4 (GPS + 4G). What does Apple Watch Series 4 do? 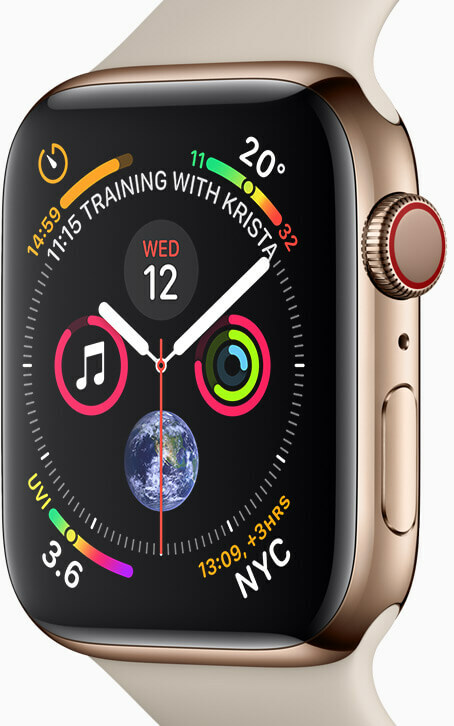 Apple Watch Series 4 is the next generation smartwatch from Apple. As well as being able to call, stream and text from your wrist, Apple Watch Series 4 comes with a wealth of additional health features for budding fitness junkies, like automatic workout detection, cadence and pace alerts, and personalised coaching. In addition, Apple Watch Series 4 acts as your proactive health monitor. Fall Detection means it can detect when you fall by analysing wrist trajectory and impact acceleration, initiating an emergency call. Emergency SOS sends a text to your emergency contacts if it senses you’re immobile for more than a minute. And if your heart rate is too low, or your heart rhythm is irregular, you’ll receive a notification that you need to speak to a doctor immediately. Plus, thanks to Apple Pay, it’s now simpler than ever to make purchases with a mere flick of the wrist.